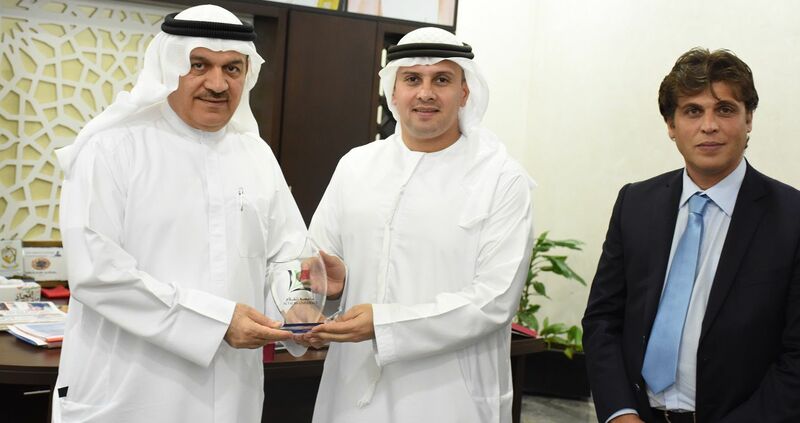 Dubai, November 1, 2015 : HE Mohammed Abdul Karim Julphar Vice Chairman of the Dubai Club for the Disabled, and Mr. Majid Abdullah Al Osaimi Executive Director of the club, with a delegation from Al Falah University came together to initiate a joint cooperation between the University and the Community Club. The association was signed during the visit by the Chancellor of Al Falah University, Dr. Noureidin Atatreh , the Vice President of Academic Affairs, Dr. Samir Barghouthi and the Director of Student Affairs Ms. Ghada Hasan, on October 31, 2015. Our members were given an extensive tour in various club departments and informed in detail the explanation of services and the potential of the club and the support of care and attention for people with disabilities in general. The delegation was briefed on the services provided by the club to its affiliates, the efforts of the club's management and the state's interest in this important segment of the community. HE Mohammed Abdul Karim Julphar Vice President of the club's board welcomed the delegation, praising the academic role played by the university in providing services to students with disabilities and the support of advanced services to serve this important segment. Mr. Majid Al-Osaimi, Executive Director of Dubai Club for the Disabled informed the delegation of the club's services in order to make use of them in the framework of the university. Mr. Usaimi said: "In the framework of a vision of future leadership, to protect disabled rights and in order to achieve full integration the Club plans to launch several initiatives that achieve full integration of persons with disabilities with their peers in all fields. The academic sector can serve in this field by the active participation of students, whether by volunteering to work with the disabled or the presence of students with disabilities in classrooms in universities. In this way the University will create awareness in the community and widely contribute to the integration of people with disabilities." Dr. Noor Atatreh, Chancellor of Al Falah Universtity expressed his pleasure in the achievements of the club at the local and international levels and confirmed that persons with disabilities have the capacity, the potential and the will and determination to excel and God helps them in their endeavors. Dr. Noor Atatreh said: "This visit confirms of our quest to maximize the societal role of the university through the provision of special services for the category of students with disabilities and to benefit from the experiences of the organizational platform of the Club to provide an ideal environment by helping them to academic excellence and overcome all obstacles that may stand in the way of their superiority." In the end, Dr. Samir Barghouthi, Vice President for Academic Affairs, endorsed that the University is ready to customize and consolidate all research and services that help people with disabilities positively engage in social surroundings as individuals capable of production and creativity. Dr. Barghouthi said: "We are working Al Falah University on the development efforts that contribute to the strengthening of existing initiatives and develop more of them in order to maximize the participation and integration of this important category in the community and encourage innovation among students with disabilities. we seek to coordinate and cooperate with the Dubai Club for the Disabled in a number of constructive ideas and we are going to turn them into realistic services for students with disabilities. We promote the concepts in healthy students." 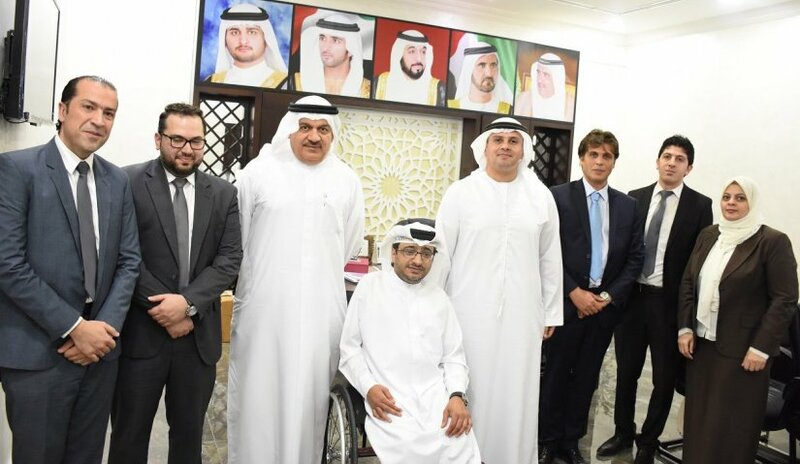 At the end of the visit, members of the delegation exchanged commemorative shields with club management for people with disabilities and expressed a desire that this exchange of visit would lead to make the most of the joint cooperation between Al Falah University and the Dubai Club for the Disabled.